So the last couple of months, I’ve been on a bit of a sushi high. I am a master of rolling sushi, and one of the rice companies brought out microwave sushi rice, so cooking it only took two minutes. For the record, this is my view on microwaves – I think some of the research is flawed, so I’m yet to be convinced that microwaves are as bad as some people say they are, but on the same token, I can definitely see that they might result in nutrient loss, so I also don’t think they’re as good as some people think they are. Does that make sense? I try to live my life honestly, which basically means progress, not perfection. We all make trades and sacrifices, right? So, I use my microwave consciously/ mindfully. Anyway, back to the point which is sushi rice. It must not have been very successful at the supermarket because it seems to have disappeared. Nooooooooo. So, I bought normal sushi rice so that I could continue my love affair. Have you ever tried making that stuff? It is not that easy my friend. Well, not when you’re in a rush anyway, which I kind of always am. I tried my hand at it. Massive fail. Basically the rice turned out like starchy glue. So then I whipped out my microwave brown rice. I mixed it up with the sushi seasoning (mirin etc) and tried to make it into a sushi roll. But, normal brown rice doesn’t stick together. On the brink of having a hissy fit, and well past the point of being over it, I dumped it all in a bowl chopped it up and just ate it…. stubbornly. And then I thought… hang on a second. This actually tastes really good. And so began a sushi bowl love affair. 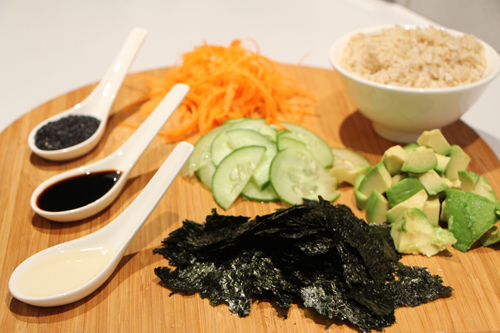 Sushi Bowl – so much easier to make! Mistake recipes are sometimes some of the best you’ll ever make – love it when that happens! Deconstructed sushi…..so hip and so delish!!! One of our fave summer salads!! !